An essential part of your backcountry safety gear is an avalanche shovel, a necessity for digging victims out of the snow in an avalanche. The action of shoveling avalanche debris is more of a chop and removal of debris than it is shoveling. A good shovel and strategic shoveling technique is critical for a timely rescue. Avalanche shovels are also used for performing common snow stability tests. 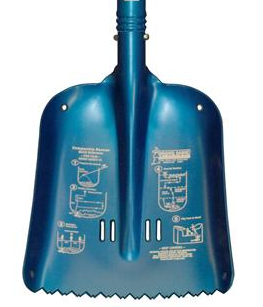 Metal has the best strength-to-weight ratio for an avalanche safety shovel that you plan to use in the backcountry. 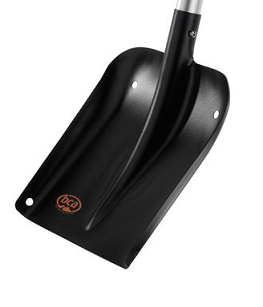 Aluminum shovels made of 6000 and 7000 series aluminum allow less deflection and are stronger and more durable than plastic shovels. Plastic may be lightweight, but metal allows for more successful snow removal. Shovel blades vary in shape and size depending on their target user. Smaller blades are easier to handle but less efficient at chopping and moving large amounts of snow, while larger blades can move more snow but take more strength to operate and may tire you more quickly. Keep in mind that it may be easier to increase your rate of shoveling with a small shovel than to consistently under fill a large shovel when you’re tired. Your shovel blade should fit easily in your backpack. It should be strong and capable of chopping through hard and dense avalanche debris. Some shovel blades are flat, some are curved, and some models have serrated blades that help cut through snow and ice. 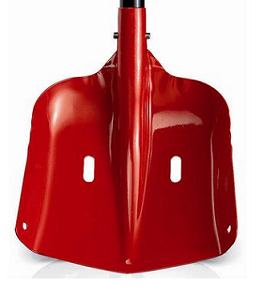 When digging snow pits and making smooth walls, the shape and angle of the shovel blade is a factor to consider; a flat blade will help you create a smoother pit wall. 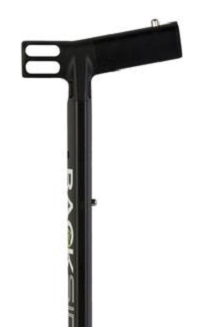 Look for a shovel that feels good in your hands while digging and fits inside your backpack. Anything on the outside of your pack is at risk of getting ripped off during a fall. 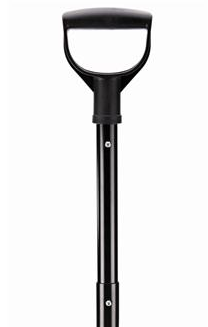 Most shovels have telescoping shafts that give you several leverage options. 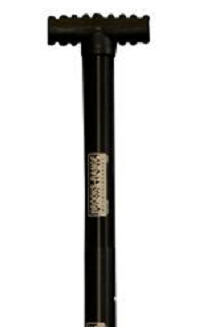 Longer shafts give you more leverage for digging; short shafts are more maneuverable in tight spaces. Shafts that are oblong or triangular in cross section can offer increased rigidity and strength. There are several common grip types. T- and L-shaped grips are often lighter and more compact, while larger D-shaped grips are sometimes more comfortable to hold and can be used with mittens. Choose a shovel grip that works well for you and your hands. Some shovels offer the ability to configure the shovel as a hoe; there are times when the most efficient method of moving snow is to chop and drag it. Sure, light is right when touring, but your shovel is not the place to cut back on weight. You want an absolutely dependable tool for effective digging and shoveling during a rescue situation – if in doubt, go a bit heavier. Be sure to read up on strategic avalanche shoveling and techniques that will help you save time and energy.